OSHA announced a proposed rule on June 23 that would modify the agency's recent beryllium standards for the construction and shipyard sectors. The proposal provides a new opportunity to comment on the rule for all interested stakeholders. Since the new proposal would make changes to the rule only for the shipyard and construction sectors, the general industry standard remains unaffected by the proposal. The proposal would maintain the requirements for exposure limits and revoke the application of ancillary provisions such as housekeeping and personal protective equipment in the January 2017 final standards for the construction and shipyard industries. For information on submitting comments on the proposed rule and requesting public hearings, see the news release. OSHA is proposing to delay the 2017 compliance date for electronic submissions of injury and illness logs from July 1 to Dec. 1. The five-month delay will allow the agency to further review the final rule to Improve Tracking of Workplace Injuries and Illnesses. Read the news release for information on submitting comments on the proposed deadline extension. Comments are due July 13. 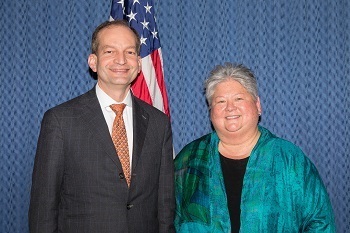 Secretary of Labor R. Alexander Acosta with retiring Deputy Assistant Secretary for Occupational Safety and Health Dorothy Dougherty. Dorothy Dougherty, deputy assistant secretary of labor for OSHA and a champion for worker safety and health, retired June 30 after more than three decades of public service. Prior to becoming deputy assistant secretary in 2014, she served as the director of OSHA's Directorate of Standards and Guidance. Dougherty first joined OSHA as chief of the Compliance and Technical Guidance Division for the Office of Federal Agency Programs. She also served the agency in other capacities, including deputy director of Technical Support and executive assistant for the OSHA Assistant Secretary. In 2016, she received the Roger W. Jones Award for Executive Leadership for exceptional public service and dedication to the work and goals of government. Tom Galassi, director of Enforcement Programs, will serve as acting deputy assistant secretary. Galassi began his career with OSHA in 1986 and he has served the agency in various leadership positions. He holds a Master of Public Health in Environmental/Occupational Health from University of Illinois in Chicago, and a Bachelor of Science in Biology from Illinois State University in Normal, Ill. He is also a certified industrial hygienist. The summer heat is on, so OSHA is reminding employers and workers about heat illness hazards and to take the necessary precautions when working outdoors. Those steps include gradually increasing shift lengths so workers can adapt to hot environments, providing frequent water breaks, allowing ample time to rest, and providing shade. OSHA’s Heat Safety Campaign website raises awareness of heat illness and its prevention and offers links to educational and training resources. It also links to a free smartphone app that allows users to calculate the heat index for their location and provides reminders about what to do to prevent heat illness. Employers and safety professionals are encouraged to use the website to share examples of how they are keeping workers safe in the heat. Stories can be emailed to HeatSafetyTips@dol.gov for possible inclusion on the site and in a future issue of QuickTakes. Heat tips and photos also can be shared on Twitter using the hashtags #WaterRestShade and #ProTips. On June 12, forklift manufacturers participated in the fourth annual National Forklift Safety Day, a nationwide event highlighting the safe use of forklifts and the importance of operator training. At an event in Washington, D.C., OSHA joined three Alliance Program participants — the Industrial Truck Association, the Institute of Scrap Recycling Industries Inc., and the American Staffing Association — in emphasizing the importance of safety and health programs and training for individuals working with or around forklifts. Through its long-standing national alliance with OSHA, the Industrial Truck Association has provided hands-on forklift safety training and developed a Sample Daily Checklist for Powered Industrial Trucks to help employers meet their obligation to train operators. OSHA has compliance assistance specialists around the country ready to help employers comply with OSHA requirements and improve their safety and health performance. These specialists support OSHA’s key initiatives through outreach to small businesses, trade associations, and other groups. To find the specialist nearest you, check the directory. 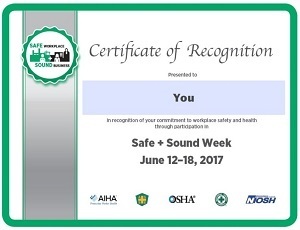 During Safe + Sound Week, June 12-18, employers of all sizes and industries across the United States and abroad joined OSHA and nearly 100 partner organizations to raise awareness of the value of workplace safety and health programs. Participants are encouraged to share photos of their events on Twitter using #SafeAndSound and to visit the Safe + Sound Week website to download your participant certificate and web badge. For more information, visit the Safe + Sound Campaign webpage. OSHA will hold a stakeholder meeting July 17 in Washington, D.C., to discuss the direction of the agency’s Voluntary Protection Programs. OSHA is seeking to reshape VPP so that it continues to represent safety and health excellence, leverages partner resources, further recognizes the successes of long-term participants, and supports smart program growth. The meeting will run 9 a.m. to 5 p.m. in the Frances Perkins Building, U.S. Department of Labor, 200 Constitution Ave., NW, Washington, DC 20210. For more information, including details on how to register by the July 10 deadline, see the news release. The American Society for Safety Engineers-Arkansas Chapter signed a two-year agreement to provide guidance and training resources that will help protect the health and safety of workers, particularly by reducing exposures to falls, electrocution, and struck-by and caught-in or -between hazards. The Hispanic Contractors Association de San Antonio renewed a two-year agreement to develop training and education programs to address hazards in construction. NGK Spark Plugs (USA) Inc. of Sissonville, W.Va., contacted OSHA’s On-site Consultation Program for help creating an effective safety and health program as the company’s production demands increased. The most significant change resulting from the consultation involved machine guarding. After consultants discovered that most NGK equipment arrived from its overseas supplier without machine guards, NGK notified the engineering team, which made the guards a standard for all machines globally. Consultants also helped NGK identify and correct deficiencies in its hazard communication and hearing conservation programs. Due to these and other improvements, NGK has been part of OSHA’s Safety and Health Achievement Recognition Program for six years, during which the company has dramatically reduced its injury and illness rates. In 2015 NGK’s rate of total recordable injuries was less than half the national average for its industry, and the company’s rate of injuries resulting in lost work was more than a third lower than the national average. For more information see the success story. An OSHA investigation of Amsted Rail Company Inc. in Groveport, Ohio, found workers exposed to silica and machine hazards. A maintenance worker’s leg was crushed after being caught in a machine, and at least four other workers were exposed to excessive levels of silica. 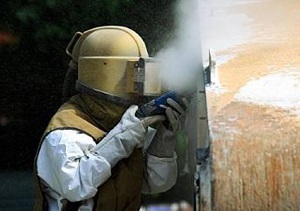 The agency cited the cast steel manufacturer for 24 safety and health violations, which include failure to: implement engineering controls to reduce silica exposure levels; install lockout devices to prevent machines from unexpectedly starting during maintenance; implement a respiratory protection program; and provide personal protective equipment. The company was proposed fines totaling $610,034 and has been placed in OSHA’s Severe Violator Enforcement Program. Read the news release for more information. A month after a 33-year-old worker died while working in an unprotected trench, OSHA inspectors found another employee of the same Missouri plumbing contractor working in a similarly unprotected trench at another job site. OSHA determined that, in both cases, Arrow Plumbing LLC of Blue Springs failed to provide basic safeguards to prevent trench collapse and did not train its employees to recognize and avoid cave-in and other hazards. OSHA issued 14 safety violations found during both inspections, and proposed penalties totaling $714,142. Trench collapses are among the most dangerous hazards in the construction industry. Twenty-three deaths from trench and excavation operations were reported in 2016 and, in the first five months of 2017, 15 fatalities have been reported nationwide. For more information, read the news release. The Oregon Occupational Safety and Health Division cited Minnesota-based Abhe & Svoboda Inc. for nine safety violations after two workers were seriously injured during restoration of the Ross Island Bridge in Portland. 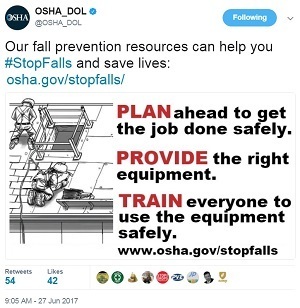 Oregon OSHA inspectors determined that the company failed to; provide adequate fall protection, construct and install the scaffolding system according to minimum requirements, and guard holes up to two feet in diameter. In February, a worker fell through a ladder opening, landing on a co-worker 37 feet below, resulting in injuries to both of them. For more information, read the news release. Michigan OSHA issued seven citations to AJM Packaging Corp. in Taylor for failing to protect workers from amputation hazards. Three willful citations were issued for not utilizing machine lockout procedures and a fourth willful citation was issued for not providing employees with training on lockout procedures. MIOSHA inspections revealed a pattern of violations that have resulted in more than 10 separate incidents of finger and fingertip amputations from unguarded machines since 2012. Read the news release for more information. OSHA has announced a new enforcement policy that excludes monorail hoists from the requirements of Subpart CC – Cranes and Derricks in Construction, as long as employers meet other OSHA requirements. The policy change was made in response to stakeholder comments that monorail hoists are significantly different from other cranes and derricks in construction. Under the new policy, the agency will not cite employers for failing to meet the requirements of Subpart CC if they meet the requirements of the overhead hoists and general training standards. The general industry requirements for monorail hoists remain intact. Read the news release for more information. A Connecticut district court has ruled that Charter Oak Health Center in Hartford must repay the lost wages of three workers who were fired after they announced their concerns about potential tuberculosis exposure in their workplace. OSHA found that the workers lost their jobs after they tried to raise awareness among fellow employees, management and the public, and after cooperating with public and workplace health agencies that looked into the workers’ concerns. Under whistleblower provisions enforced by OSHA, employers are prohibited from retaliating against employees who raise concerns about workplace health and safety. For more information, read the news release. OSHA has released a new fact sheet explaining how the agency’s Confined Spaces in Construction standard affects common spaces in residential construction, such as attics, basements, and crawl spaces. The fact sheet, developed after consultation with the National Association of Home Builders, and a detailed Frequently Asked Questions document, clarify some of the standard’s provisions and their application to residential construction work. The electric power industry has released a case study to show the integral part safety and health programs play in keeping electrical workers safe on the job. These programs share three key traits: management leadership, worker participation, and coordination at multi-employer worksites. A focus on identifying and fixing hazards before they cause harm helps the industry maintain reliability for its customers, while also ensuring the safety and health of its workers. A new hazard alert, published by CPWR-The Center for Construction Research and Training, reviews heat hazards and the steps to prevent heat illness while working in hot weather. Extreme heat causes more deaths than any other weather-related hazard. Each year more than 65,000 people seek medical treatment for extreme heat exposure. 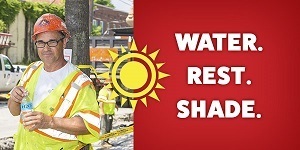 The alert, available in both English and Spanish, along with other tools and resources to help protect workers from the heat, are available on CPWR’s working in hot weather webpage.